America is never more divided than on the topic of Canada. Perhaps that was an overstatement, but I often laugh at the split opinion amongst Americans when speaking about Canada. The majority of the United States is ignorant about the Great White North, but that doesn’t stop them from having opinions about it: Why isn’t it the 51st state in the union? Isn’t that where snow comes from? Hockey, eh? Personally, I have a fervent, yet random love for Canada. After all, the first novel I read was the Prince Edward Isle-set Anne of Green Gables. That can make a big impact on a girl. It has always fascinated me to think there is an English-speaking country just north of us. When I met several Canadian friends a few years ago, I realized they are so much different than Americans, despite our similar language. Eh. This summer, I took my first step on Canadian soil and I wish I had a Bryan Adams song to sing for you to commemorate it. I traveled all the way to Seattle for work, where my boyfriend flew out and toured around with me. We spent a full day on the ferries and in Victoria, British Columbia solidifying my opinion of Canada: Canada is much like the offspring of America and Europe, while still having its own, unique atmosphere. 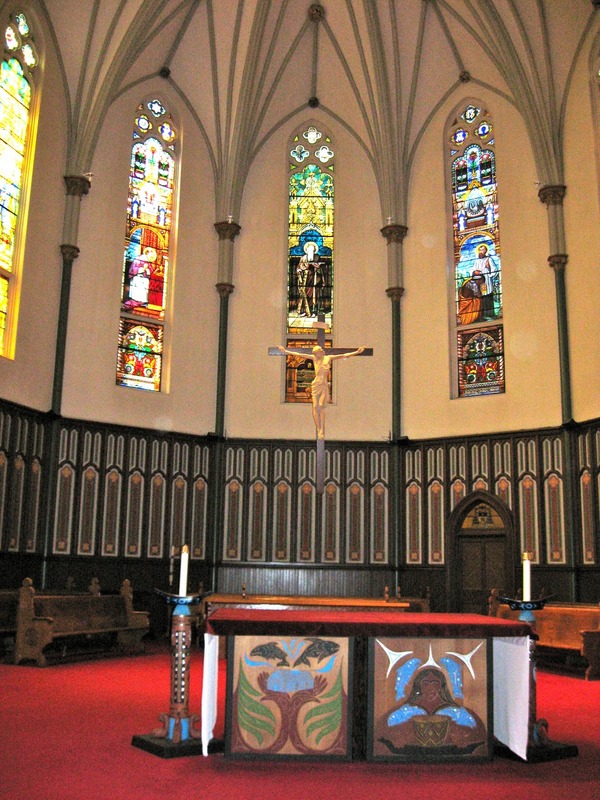 After several hours of walking around the beautiful, tourist-filled city of Victoria, my boyfriend and I stepped into the first Catholic church we found to sit in front of the Blessed Sacrament. Lo and behold, I think we found one of Victoria’s most popular and beautiful churches, St. Andrew’s Cathedral. According to their website, St. Andrew’s Cathedral was dedicated on October 30th, 1892. The red carpet gave it a homey, small church feel, but the size prevented that perspective from taking over. 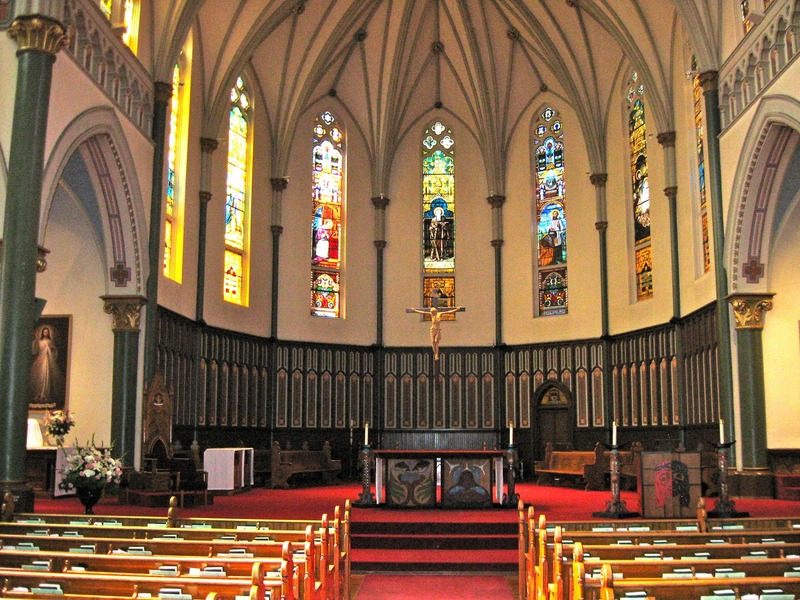 It was the perfect metaphor for the Catholic Church: not only could we walk in there, worshiping the same God, but we could sit in front of the same Sacrament in a busy city, and still feel a “small town” tug. The summer sun poured in the stain glass, which seemed more potent as I always thought Canada had the delight of being blanketed in snow year-round and never saw the bright light of the summer months. 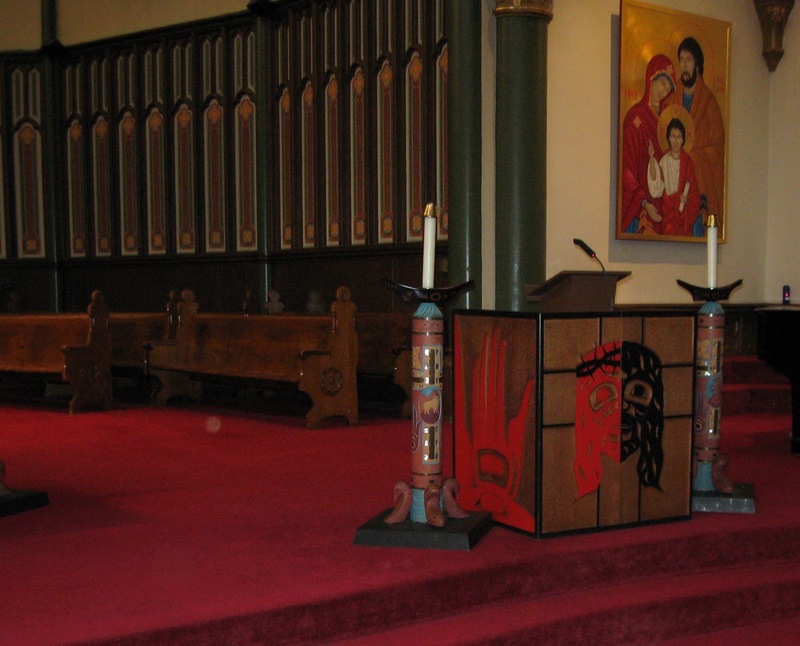 Notice the art carved into the altar and candle stands has a Native Canadian inspiration. Does anyone else see this and immediately think of Free Willy? What strikes you about this painting? Joseph makes an appearance? 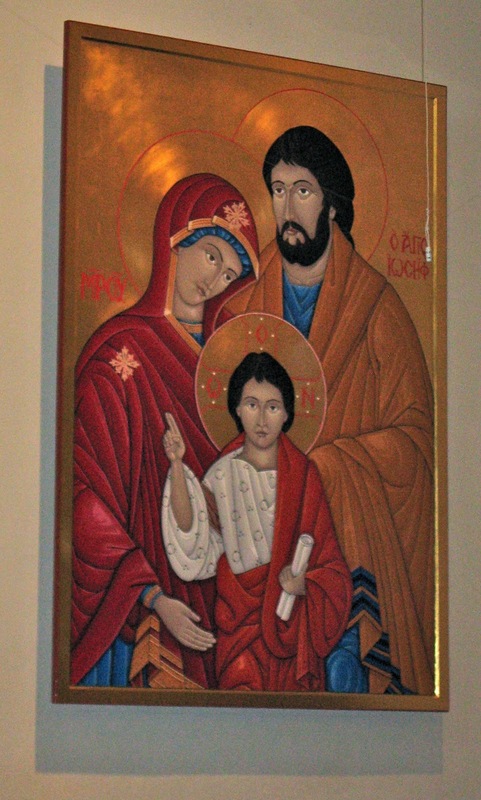 How often do you see a painting dedicated to the whole Holy Family? So often we see Mary and Jesus alone, but I’m glad to see Joseph and his stoic glance accompanying the Native Canadian art in this Cathedral. Forgive me, dear readers and Allie, for holding your hand through one of the objectives of Allie’s traveling, church-visiting blog: It is unspeakably wonderful to live the reality of this universal Church of ours. We stepped into a church as far away from our houses as we could get on this continent and still felt at Home. When you travel in the future, give a thought to visiting a local church. You may not find an art treasure as we did, but you will definitely find the Presence of Christ. I LOVE Icons!!! Sometimes I think I should be Byzantine, :). Very pretty Cathedral, thanks for the post. I ditto your love of icons! One of the largest icon distributors in the US is just west of me, and I would love to visit them sometime to see how it’s all done. Love the mix of art —- wow – hmm – God inspires so many styles.. in art, and in us! Thanks so much! I’m glad Elizabeth had the chance to write up about her experiences out on the west coast – I stick pretty firmly to the east and middle of America, so it was nice to get some geographic diversity, not to mention a different perspective!